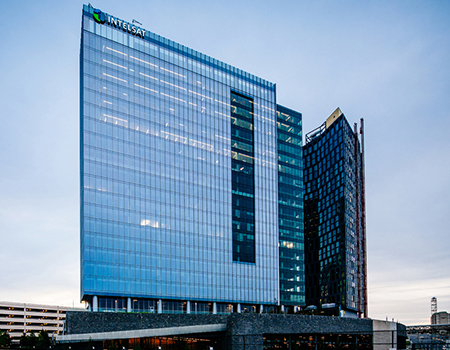 Discover the premier office space that is reshaping Tysons Corner: Tysons Tower. Now the tallest building in Tysons Corner Center, Tysons Tower is a sustainable, state-of-the-art working space with exceptional amenities. Soaring 22 floors above the Beltway, Tysons Tower is the tallest building in Tysons Corner Center with panoramic views of Northern Virginia and beyond. The building is LEED® Gold certified and serves as the regional headquarters for some of the most prominent consulting, technology, financial and federal contracting firms in the world. Located at Tysons Corner Center with direct access to the Capital Beltway (I-495), new 495 Express Lanes, Route 123, and the Tysons Corner Silver Line Metro Station. LEED® Gold. Learn more about our sustainability or contact for sustainability information. Tysons Tower achieved LEED® Gold under the more stringent 2009 guidelines, and is an efficient and comfortable building in which to conduct business. With floor to ceiling windows and solar shades on the south elevation, Tysons Tower attracts forward-thinking companies whose employees appreciate the value of working in a sustainable and healthy environment. See photos and videos of the soaring office tower. Save Big at Tysons Corner Center. When you are a part of Tysons Corner Center's campus, not only are you steps away from over 300 shops and restaurants, but as a resident of VITA Apartments, employee of 1861 International Drive and Tysons Tower, or guest of Hyatt Regency, you can download the All Access App, entitling you to exclusive rewards, VIP discounts and offers at Tysons Corner Center only for you. Download in the Google Play store for Android devices or Apple App Store to access deals and discounts at restaurants and retailers, invitations to upcoming events, details about ongoing activities and information about 1861 International Drive.